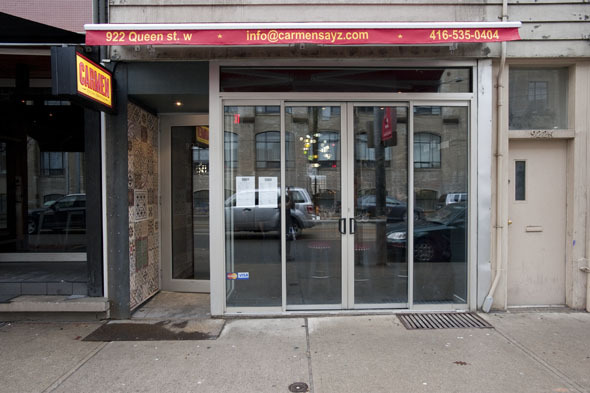 Carmen, the new sister restaurant to Kensington Market's Torito is now open on Queen West in the space formerly occupied by Caju. Chef Luis Valenzuela and Veronica Carmen Laudes celebrate the boisterous spirit of tapas dining with traditional small plates, Iberian inspired entrees and shareable paellas, not to mention a well curated list of native wines. Perched at the bar, I take in the lovely room that mingles curvy modern lines (a la Antoni Gaudi) with warm woods and cool stone finishes. Black and white flamenco inspired photos, Royal Doulton figurines add playful touches, while extra wide red tufted stools and long banquet tables accommodate a multitude of plates without ever feeling cramped. 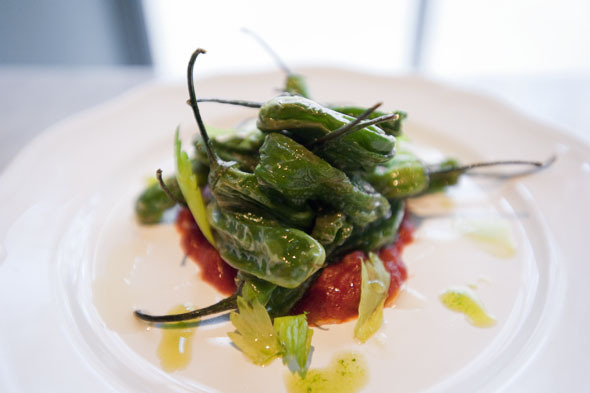 On the menu, The main attraction is the selection of tapas from which I try the flash fried Padron Peppers ($10) and ethereal sheets of Jam贸n Serrano ($10) simply drizzled with olive oil, which displays the utmost confidence in the product. 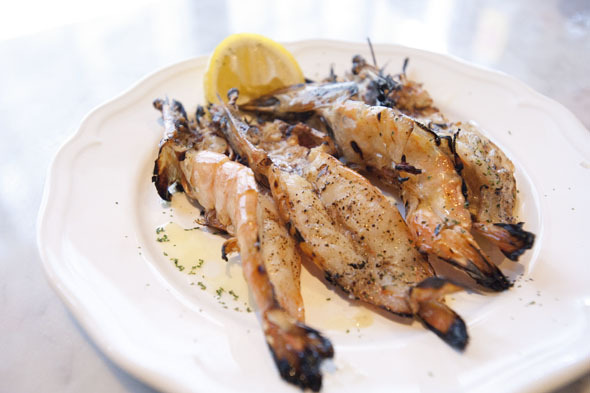 Adding to the spread, the Gambas al Ajillo al "Estilo Carmen" ($12), a plate of slightly charred, garlic chili shrimp that are appreciatively served heads-on for maximized flavour. The playfully plated (it's served in a sardine can), Mejillones en Escabeche ($7) packed with mussels and brunoise veggies preserved in sherry vinegar and chili oil. Of course salty, spicy fare like this needs refreshments, but I experience a little sticker-shock eyeing the $14 (12 oz) glasses of sangria (pitchers are not on the menu) and opt instead for the citrusy house cocktail, Carmen ($12). 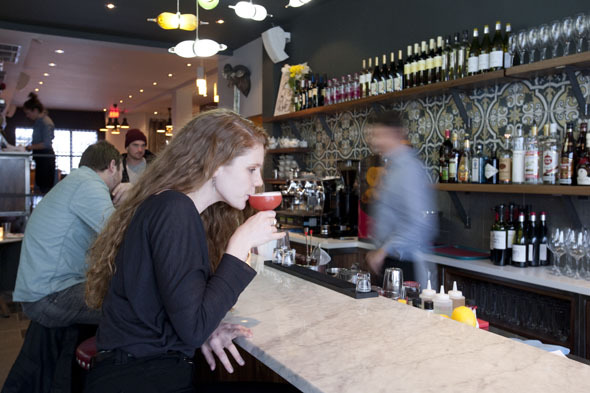 The wine list boasts a dozen Spanish and Argentinean wines (Cava? Tempranillo? 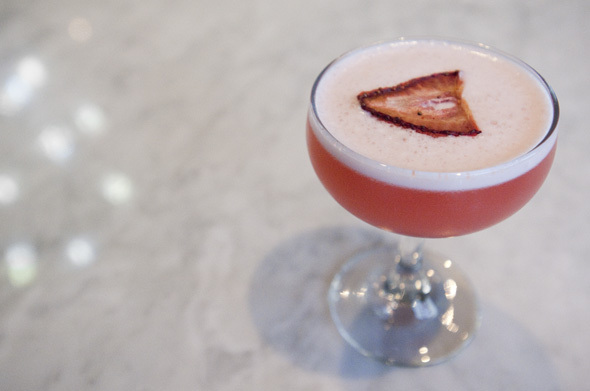 check), as well as sherries by the glass ($5-8). 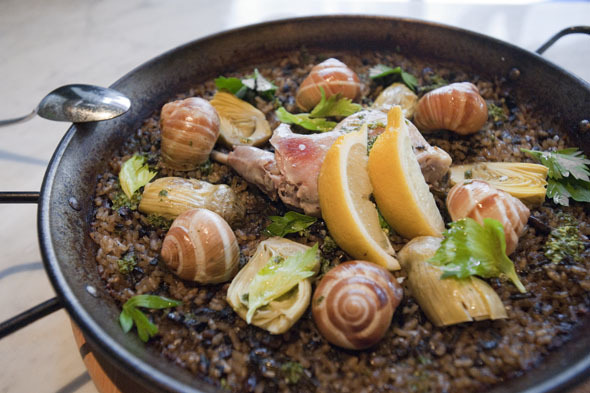 The Paella de Monta帽a ($30) is flecked with mushrooms crusted to the pan and topped with artichoke, snails and rabbit. Recommended for two, its about two thirds the price of the similar rice dish at Patria and I like it better here too, it's less salty, more earthy. 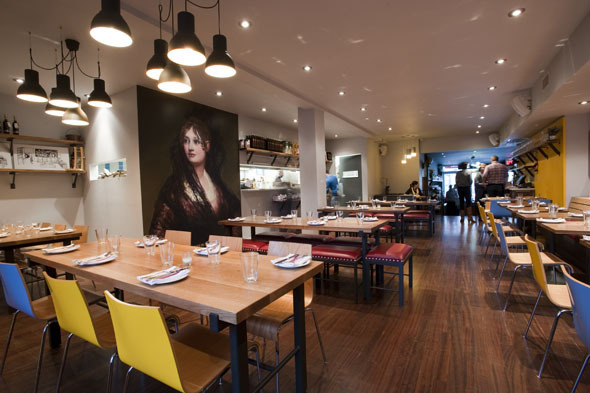 Carmen is currently open for dinner and late night nibbling, but daytime hours can be expected in the coming weeks.